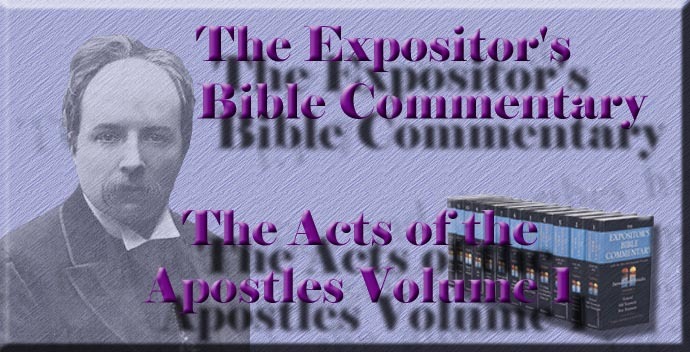 The Origin And Authority Of The Acts Of The Apostles. The Conversations Of The Great Forty Days. The Ascension Of Christ, And Its Lessons. The First Fruits Of Pentecost. First Recorded Miracle And First Persecution. Honesty And Pretence In The Primitive Church. Acts 4:36, 37 ; V. 1-6. Primitive Dissensions And Apostolic Precautions. St. Stephen And The Evolution Of The Christian Ministry. Acts 6:5, 6 ; 8-1 1. St. Stephen's Defence And The Doctrine Of Inspiration. Simon Magus And The Conversion Of Samaria. St. Peter And Simon Magus. Evangelistic Work In The Philistine's Land.